Placental macrophages being infected by Zika virus. Zika antigens appear in red. 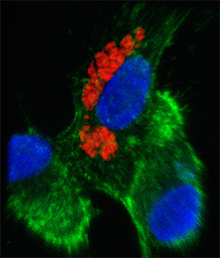 Blue shows the cell nucleus, green the cytoskeletal protein actin. From Quicke et al, Cell Host Microbe (2016). The results are published in Cell Host & Microbe. Our results substantiate the limited evidence from pathology case reports," says senior author Mehul Suthar, PhD, assistant professor of pediatrics at Emory University School of Medicine. "It was known that the virus was getting into the placenta. But little was known about where the virus was replicating and in what cell type." Scientists led by Suthar and Emory pediatric infectious disease specialist Rana Chakroborty, MD, found that Zika virus could infect placental macrophages, called Hofbauer cells, in cell culture. The virus could also infect another type of placental cell, called cytotrophoblasts, but only after a couple days delay and not as readily. Other researchers recently reported that syncytiotrophoblasts, a more differentiated type of placental cell than cytotrophoblasts, are resistant to Zika infection. “Not every pregnant woman who is infected by Zika transmits the virus to her fetus,” Suthar says. “Host genetics and non-viral factors, including nutrition and microbiota, as well as timing may be influencing infectivity. A better understanding of these factors could allow the design of preventive measures, and eventually antiviral therapies." It is still possible that disruption of the placental barrier -- as seen in a recent case report -- or antibody-mediated mechanisms are contributing to placental infection by Zika virus, he says. Hofbauer cells are fetally derived, in contrast with other immune cells found in the placenta called decidual macrophages, which are maternally derived. They are thought to be more tolerant and less prone to inflammatory responses than other immune cells, based on previious work from co-authors Chakraborty and Erica Johnson, PhD. The first authors of the paper are graduate students Kendra Quicke and James Bowen. Additional Emory co-authors include Jens Wrammert, PhD, Bassam Rimawi, MD, Bali Pulendran, PhD, and Raymond Schinazi, PhD. Research in Suthar’s laboratory is supported by the National Institute of Allergy and Infectious Diseases (U19AI083019, R56AI110516, R21AI113485).